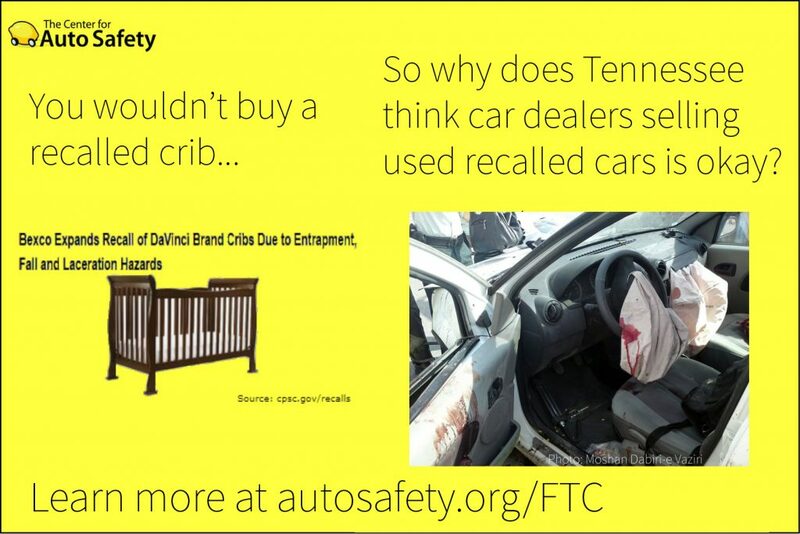 Center for Auto Safety today joined other consumer groups highlighting a new, unprecedented Tennessee law, sneaked through in the waning hours of the legislative session, that will take effect January 1, 2018 making it easier for auto dealers to get away with charging top dollar for recalled used cars with lethal safety defects. “Tragically, Tennessee’s new law is likely to result in more dealers in that state engaging in ‘recalled used car roulette,’” said Jason Levine, Executive Director of the Center for Auto Safety. “Buying a used car should never mean you are putting your life, and the lives of your family, at risk.” Learn more about how unpopular the idea of selling unrepaired recall cars is in Tennessee: here. Today, the Center for Auto Safety is proud to partner with the Consumers for Auto Reliability and Safety (CARS) Foundation, and the MASSPIRG Education Fund in releasing a new report showing that since 2015, the nation’s largest retailer of used cars, CarMax, has more than doubled the percentage of recalled used cars for sale to consumers, based on recent surveys of nearly 1,700 vehicles at 8 locations in California, Connecticut, and Massachusetts. The dangerous and unsafe defects on these cars advertised for sale included Takata airbags and GM ignition switches, both of which have been linked to multiple deaths.